Matthew passed unexpectedly at El Camino Hospital, a few blocks from where he grew up. Matthew was born in Chicago Illinois and moved to California when he was barely a year old. He graduated from Awalt High School in 1974. Matthew had a career in the semi-conductor industry. He went to school in Tulsa, Oklahoma for mechanical engineering. His technical background transcended into many facets of the semi-conductor field. Matthew enjoyed being a starter flagman for the Sports Car Club of America. He flagged on racetracks in Laguna Seca and Infineon Raceway. He enjoyed music and being with friends and family. Matthew was preceded in death by his mother Esther Amador Luna and his father Matthew Luna. He is survived by his daughter Maria Luna and her husband Louie Herrera of Sunnyvale his grandchildren Tomas and Kamille Herrera and adopted daughter Skyler Klier of Manteca, his sisters Maria Carmella Luna and her husband William Stainback of Novato, Martha Luna and her husband Steve Deutsch of San Francisco and Marcella Price of Mesa, Arizona and many nieces and nephews. Services will be held for family and friends at The Cusimano Family Colonial Mortuary on Saturday December 8th at 4:00 p.m.
Floral contributions will be gratefully accepted. 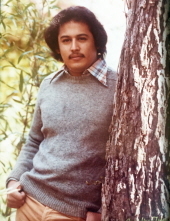 To plant a tree in memory of Matthew Lawrence Luna, please visit our Tribute Store. "Email Address" would like to share the life celebration of Matthew Lawrence Luna. Click on the "link" to go to share a favorite memory or leave a condolence message for the family.